Remember that story about the city mouse and the country mouse? They both decide one day that they are really fed up with where they live. One is too noisy and the other too quiet. So, they decide to switch places because they think that the other has it so great where they live. At the end of the story, both mice discover that they really miss the sights and sounds or not sounds of their original places and realize that they really do love living there. A week ago, this suburban mouse spent two days in the Big Apple, crashing on my best friend of 20 year's couch while we celebrated his bachelor party festivities. I have to say that being in a city like NYC really made me appreciate living in The Burbs. I can equivocally say that city life is just not for me. It's not just the people rudely bumping into me (they have to see me right? ),the massive amounts of people that just seem to be EVERYWHERE, or the subway car packed so full of people I got to know an elderly man pretty well. Clearly, there are just city mice that are just into this sort of thing. What struck me more and what I watched more often than the trendy people walking the streets with a purpose, were the families with kids in the city. I give it up to you people, you amaze me! I have a hard enough time getting my almost two year old to constantly hold my hand and not run in a parking lot and NYC is basically a HUGE parking lot. I don't know how you do it. NYC Dads, my hat's off to you. Navigating the city and keeping your kids safe is an astonishing feat. I guess that if you grow up there kids just get used to it and are street smart about crossing. NYC kids must run clinics on how to properly cross without getting flattened because it almost happened to me a few times and I KNOW that they see ME! If you are a NYC Dad or parent and you want to hang out with the pros of the city then check out their Facebook page: NYC Dads. They have all kinds of great events for you and the kids and they will help you become a pro too. For this suburban mouse, I will enjoy my life in my cul de sac neighborhood but know NYC that I also appreciate the following other thing you showed me: cabbies. As crazy as you drive, you helped make my life easier when I was there and got me back to my kids on time. Thank you NYC! Finding time. My dad was always working but he always found time to spend with myself and my brothers. He played catch with me, came to my baseball games and even participated in Indian Guides and Cub Scouts with all my brothers and me. Indian Guides was a fun time for me and my dad. If you aren’t familiar with Indian Guides it was a form of male bonding centered on Native American themes which was run by the YMCA. They may now call it Adventure Guides or Indian Princesses for little girls and their dads. We had pow-wows and the head of our tribe wore a headdress and we called him the Chief. We went on sleep overs, learned how to shoot bows and arrows, and did activities with our dads. My favorite part was our attire which was a felt vest which held our patches and donned our Indian names. We got to choose our Indian names. My older brothers were Running Deer and Rising Sun. Whatever the son was, the dad was the big version of that. My younger brother was Little Eagle and therefore my dad was Big Eagle. Although if you have seen myself or my dad he probably should have been called Bald Eagle. When I was in Guides I was doing a book report on an animal that I thought was interesting. Unfortunately for my dad I wanted to be Little Beaver so of course he became Big Beaver. As a dad now I can only assume that sitting around at night drinking beer and playing cards while the kids slept which my dad tells me was an added bonus to doing Indian Guides, Big Beaver got lots of flak for his name. While reading Hop on Pop, which is another game my kids love to play I came across this image. Ever have one of those days? I can honestly say that staying at home is the greatest job ever and that I am closer to my kids because of it. However, just like any job there are frustrations and failures, some even of epic proportions. What happens when you don't have anyone to share your experiences, failures, or accomplishments with? Recently, I got into one of these funks. After the convention I was riding a high. It was indescribable what it feels like to go to a place where all the dads are like you. Most of them even dressed like me in the goofy T-shirts and cargo shorts, so it made me feel like I was a part of something bigger. I was excited and was raring to find other dads like me that I could start a group with in my area. Then, I got a dose of reality. I would spot a guy alone with some kids and I would ask him if he was a stay at home dad anxious to talk about my new group and my ideas with someone. Dad after dad said something like "I am just helping out today" or "Just giving my wife the day off" and it became disheartening. My wife had to remind me that I am still in the minority even though we are a growing number and that in time, I would have my group. We are planning a group that will focus on other dads in my area. I am hoping that by creating the group that dads will find me and not only allow my kids to socialize but for me to make friends as well. It has been about a year since we moved here and while I "know" most of my neighbors, finding guys who do the same things or experience the same things really is going to be key in pulling me out of this feeling of despair. Unfortunately, when I get down it affects my mood and my desire to run things smoothly. Your kids will notice it. Mine did. 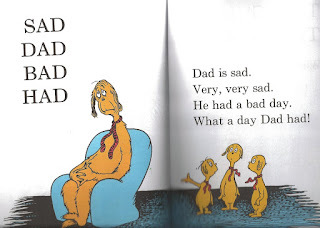 My son asked me "Why are you so sad? You don't seem as happy as you used to be" If I were in a corporate job right now I would most certainly be on a performance plan. After the convention I was excited and full of ideas and when it didn't immediately come to fruition I shut down a bit. I think it is mostly due to the fact that stay at home dads can often feel like they are isolated. I know that this is not the case nationally as I am part of the National At Home Dad Network but locally getting connected to other dads is key. So, if you are an at home dad and you are feeling left out. Seek out Meetup groups in your area. Do a search for stay at home dads in your town. I am doing something about it. I found Main Line Dads and contacted another dad in the Philly area. Things are looking up for my group. You are not alone and neither am I.